Am I the only one anxiously waiting for Thanksgiving weekend so we can go see The Good Dinosaur? Well to help hold me (and you) over they have released another trailer! 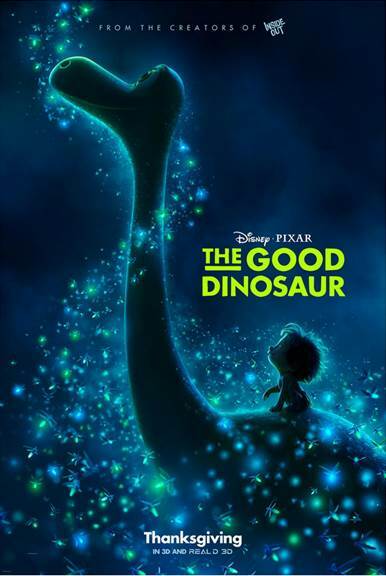 If you are unfamiliar with The Good Dinosaur let me tell you a little about it. So we know the reason there are no longer dinosaurs is because a pesky meteor decided to crash into Earth and make some dramatic changes ending the reign of the dinosaurs. But what if? What if that meteor has missed Earth? Then what? That is exactly what happens in the good dinosaur. Arlo, an Apatosaurus, is separated from his family and is trying to get back to them. He finds a human that takes a liking to him. Together they travel the land trying to find Arlo’s family. They have some scary moments as they learn the world can be a dark and scary place. But they make it through together. Throughout their travels, Arlo learns to overcome his fears and discovers just how strong he is. The Good Dinosaur is a family friendly movie opening November 25th at theaters nationwide.